Malaga city has a prosperous nightlife all the year round and different from other places along the Costa del Sol that are often claimed by foreigners, you will get the chance to actually encounter Spanish speaking locals in the bars and discotheques of Malaga. The city offers a great variety of nightlife, ranging from the typical Tapas-bars (ideal if you want to taste Andalusian specialties), traditional flamenco performances, cozy small pubs or lively clubs in the city centre. Street life is deeply rooted in the Mediterranean culture and that for it is pretty common to see whole families and groups of friends meeting in bars, terraces and beach bars, enjoying the warm and pleasant summer evenings. The old town of Malaga, near the cathedral, the streets Granada and Beatas and Uncibay Plaza, offer a wide range of clubs, pubs and nightclubs, where you can find people of all ages. Another, more modern area with fashionable clubs for a younger audience and as well restaurants is La Malagueta, located south of the Plaza de Toros. The area of El Palo / Pedregalejo is a good mix of Málaga neighborhood with a large number of young foreigners due to the presence of several language schools and therefore has a considerable number of bars, both traditional tapas bars and more fashionable bars. 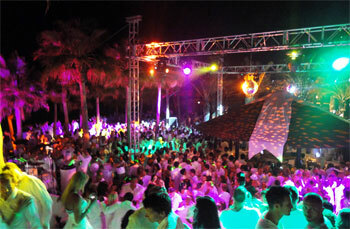 The nightlife in other municipalities of the Costa del Sol, though very animated in all locations during the summer months, varies slightly with each location. In the Eastern Costa del Sol, with the nuclei of Nerja and Torre del Mar, Nerja tends to have a more relaxed setting, while in Torre del Mar there are many discos and night clubs. In the western Costa del Sol are famous for their nightlife mainly Torremolinos and Marbella. Torremolinos has a host of nightclubs, some of the biggest clubs in the area with several floors and pools and is quite famous for its gay ambience; meanwhile Marbella is the epitome of luxurious nights in exclusive clubs. Between the two localities are located Benalmadena, with one of the two casinos on the Costa del Sol and an award-winning Marina with a large nightlife offer, and Fuengirola, with a more relaxed and familiar atmosphere, though not less animated. The nightlife usually starts around midnight or 1 am since the Spaniards tend to have dinner very late, and the majority of the clubs do not close before 4 am, so it s not uncommon to find locals leaving the bars at dawn to stop off for a bite of breakfast on their way home. Remember that driving under the influence of alcohol is a crime in Spain. If you need transport, we recommend that you use the services of MalagaTaxi.co.uk. They have special prices for nights out and private party transfers in Malaga and the Costa del Sol.